Kacie Komoto takes a swing off the fairway. Hoping to conclude her disappointing season on a high note, the senior will take part in her final Big Ten Championship this weekend. The Big Ten Championship is likely just the first step in a long postseason journey for Northwestern, but that doesn’t mean the Wildcats are looking past their chance at a conference title. For two straight years, NU has split the Big Ten title with Ohio State. Last year, the Cats clinched a share of the title with a clutch 10-foot putt by then-freshman Stephanie Lau on the 18th hole on the final day. Two years ago, then-freshman Sarah Cho took home the individual championship as NU stormed back from a six-shot deficit entering the final day to tie the Buckeyes. But another split won’t be good enough for senior Kacie Komoto this year. Komoto herself has struggled for much of her senior season. As the Cats won the Hurricane Invitational, Komoto tied for 42nd with a 9-over-par weekend, and none of her scores ended up counting toward NU’s final victory total. The senior also struggled at the final tournament before Big Tens, finishing tied for 76th overall at the Silverado Showdown at 17-over after struggling on the greens all weekend. 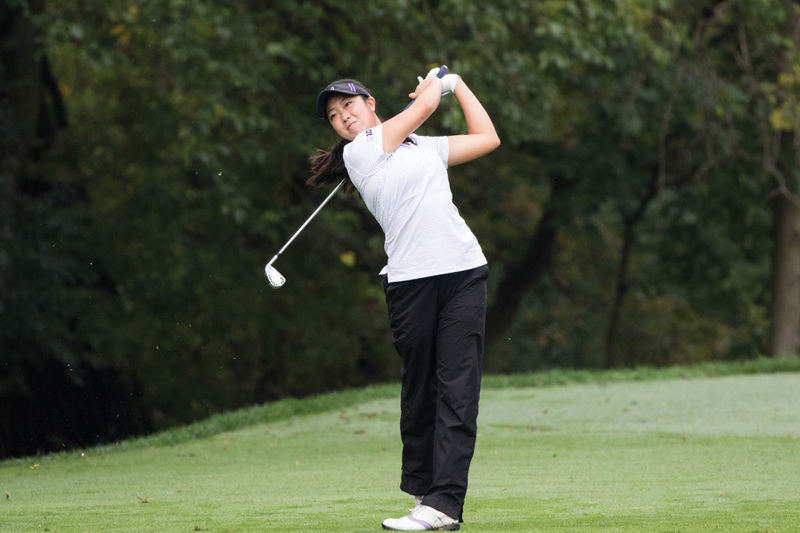 Coming into her final Big Ten Championship, Komoto is excited for her chance at redemption. Komoto’s struggles have been mitigated by the performance of NU’s undisputed top player, junior Hannah Kim, this season. Kim won both stroke play tournaments NU participated in during the winter season. Kim’s dominance wasn’t limited to stroke play either, as she bested defending NCAA national champion Virginia Elena Carta in match play against Duke earlier this year. This success, however, hasn’t changed the junior’s drive to get better heading into the postseason. The Cats will face a unique test this weekend at the TPC River’s Bend course in Ohio. Coach Emily Fletcher said none of the NU golfers have seen the course before. They are far from the only ones coming in blind, however, as Fletcher also said no Big Ten team has seen the tournament before. Because of that, Thursday’s practice round will take on exaggerated importance for all golfers. Fletcher stressed the importance of the short game in the practice round, but recognized that expected cold weather on the weekend could make conditions in later rounds treacherous.